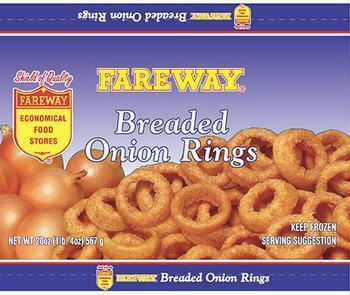 McCain Foods USA is recalling retail, frozen onion rings sold and distributed under private label retailer brands. The products contain milk, an allergen not declared on the label. The production date code will begin with the letter “V” and can be found on the back of the package in the lower, right hand side or next to the cooking instructions. The production date is documented on the bag via the following format: VYYMMDD. V=Production Plant Impacted by Recall. YY=Year. MM= Month. DD=Day. For example, a recalled product with the production date of March 10, 2015 would have the following date code on the bag: V150310. Customers who have an allergy or severe sensitivity to milk should throw out unused product or return any of it to the place of purchase for a full refund. Consumers with concerns or questions about the recall may contact McCain Foods at 877-804-6198 (Monday – Friday, 8 a.m. – 6 p.m. EST).